And the music in the c64 version? Why did they do that? The original was so cool!!! The music in C64 version is also good. Rob Hubbard is the guy who makes music for many C64 games. But I agree the music from the arcade version is already great. I guess for the C64 version they might not get a permission or the rights to use from the original composer (a japanese lady). The NES version, however, is the same as arcade. Probably the lady wanted too much money and they had to go for an alternative version. I like most of the tunes of Rob, but the original one was already fantastic. I didn't see the need to change it tbh. it's possible they didnt have a license for the music. it depends if capcom had it made for them, or got it from a seperate artist. Fantastic repair job mate! I really enjoyed your very detailed walkthrough. I have repaired a couple of bootlegs myself and I surely know how it feels...This game is like a holly grail for many of us.Loved it since I was a kid,still enjoy playing it! Please give it a try and you wont regret it! I've played this on my ezflash cart. Can confirm, this remake is legit! I played the remake recently since I got a c128 hooked up. It’s awesome. Especially the title music. Interesting to read about the music, it was Mark Cooksey who did the C64 background music BTW (not Rob Hubbard) A similar thing happened with the 64 version of Ghouls N Ghosts, where they used Tim Follin's tunes instead of copying the Arcade. Today I have tried to finish my ghosts and goblins and found out a weird glitch. Some blocks sometimes just disappear and get replaced by something else. It's not only sprites, Arthur could literally fall if one block was making a bridge or a ladder. I guess something is wrong with my pcb, where to start looking ? Any guess ? 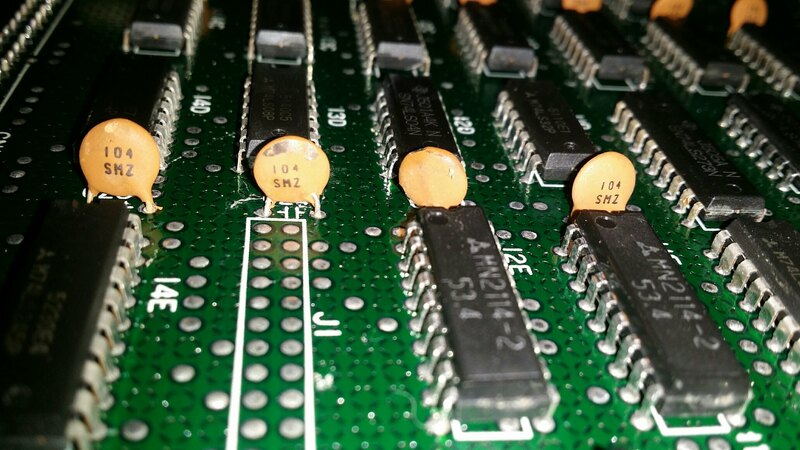 Start by carefully removing and reinstalling each of the socketed ROM chips. If you have access to an EPROM programmer, dump each chip and compare the checksums against MAME. Do you guys read it as 0.1uf ? what does 104 SMZ mean ? The caps on my GnG are labeled slightly differently than yours, but similar specs apply. The are simple ceramic by-pass capacitors of 100000 pF (or 100nF or 0.1uf), the board will work also without them. Thanks @caius I start to compare the files today. Roms 3-4-5 has been reprogrammed they have a hand written label and one of the 3 doesn't read like the usual mame romset. I don't have the exact same reference chip on the top3000. Is there a trick to program these eproms with the settings ? The eprom start programming when I change the buffer start to 7FFF but stops with error at 7FFF. The post was edited 1 time, last by archimage ( Oct 5th 2018, 12:34pm ). any 27256 should be o.k. for settings, but i suspect the chip is bad. if you have to replace any, use cmos parts 27c256. they run cool and use much less power. I had success writing the roms with buffer starting from 8000 for the Toshiba TMM27256D and buffer 4000 for the Mitsubishi M5L27128K but it doesn't seem to work on the pcb. From what I understood data begin to write at 8000 and 4000 ? I just noticed that the software was saying buffer 0000-7FFF and 0000-3FFF then guessed it should start from that point ? I think it doesn't make much sense data should start at 0000 and finish at 7FFF. The 3 chips have the same problem, so maybe I am doing something wrong (not used to burn eproms often). I will try to expose more to UV maybe. Another question : would any region rom work or should I stick with a specific region set ? The post was edited 2 times, last by archimage ( Oct 5th 2018, 3:45pm ). First, I must say, the problem you observe most likely not because of a ROM. Ofcourse thats just my "hunch"
- EPROM burners we use are generally low quality cheap ones (at least mine are so ) and their ZIF sockets gets rusty also. Clean them with metal brush like you do on EPROM legs. - When you lock the ZIF socket after insering the EPROM, force the EPROM a little (few milimeters left and right) with hand side ways. This will agitate the contact point between legs and zif socket and if there is corrosion there it will sanded away. Believe me, it may sound stupid like blowing to NES cartridges but works for me if I have read/write/verify errors. 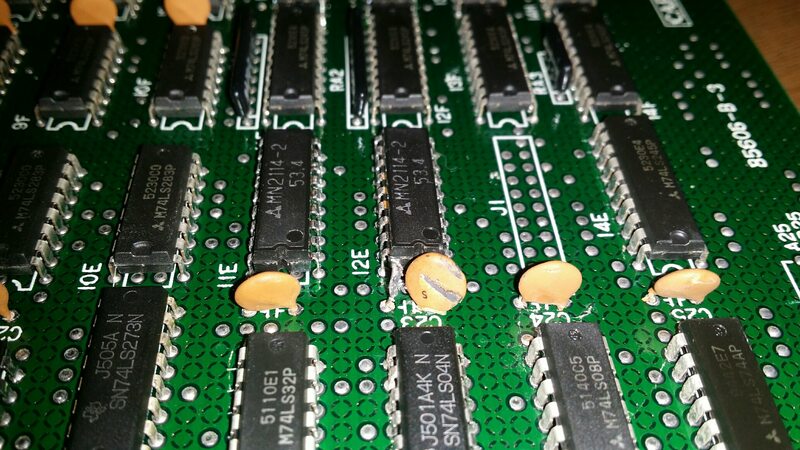 - Old eproms sometimes not get erased easily especially with cheap chinese eprom erasers. I generally clean the glass window on the erpom with a cue tip dipped in alcohol or acetone and give good 30-40 minutes. If that doesnt work the chip may have long gone. Just use another fresh one, especially a newer CMOS type as @stj said. If after this you manage to burn the ROMs and you still have glitches. Just share couple of photos which may help us elaborate more. I suspect a faulty logic IC in some part of object addressing stage may have faulty output. But thats just speculation for now. Regarding your questioı about region set. I think they would all work. Japanese version is mushc harder, thats what I've heard.